The UHSAS, originally manufactured by Particle Metrics, Inc. and now by Droplet Measurement Technologies, measures the concentration and size distribution of aerosol particles having diameters from 0.060 --1.0 µm, in 100 bins that are approximately logarithmically spaced. The instrument flies in an under-wing canister and senses particles in the airstream via light scattering from individual particles. The maximum counting rate is about 3000/s, so the maximum concentration (at a sample rate of about 0.7 standard cm3/s) is about 4000 cm-3. Flow control is via a mass flow controller, but the data files provide measurements in ambient concentrations (not at standard conditions). Data are transferred via RS-232 to the GV central data system and recorded there. The specifications for the instrument limit its operation to > -40°C and < 12 km altitude, and there have been some operational problems at higher altitude and lower temperature, notably noise in the first channels or anomalously low measurements of concentration. These have been addressed through modifications to the instrument and are not expected to be present in future experiments beyond 2012. The instrument covers the full size range through the use of two different detectors, each having two different gain circuits, and there is some overlap among the sensitive regions of these four channels so the instrument must choose the best signal for each size pulse. The ranges change somewhat during flight, so sometimes gaps or discontinuities develop in the size distributions. This also has been addressed in recent changes and is expected to be of less concern in projects beyond 2012. The probe must receive a startup record, which can come from a host laptop PC with a LabView application, or from a static record sent by a Data System Module (DSM). The instrument fits in a standard 6" instrument wing pod. See the 'Documentation' link at right. 2007, DMT: Refit detector that was rubbing inside of canister. 2010 March, DMT: Maintenance; change gain stage resistors to improve overlap regions, change amplifiers to reduce temperature sensitivity. 2010 Sep during PREDICT, RAF: Add tube to inlet needle, avoiding cloud particle interference. 2010, RAF: Instead of DSM, laptop provides startup record to probe. 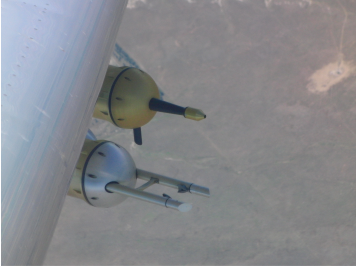 2011 April, RAF: Move pressure sensor to measure within aerosol stream instead of canister interior.